Every Saturday, my CrossFit gym invites friends to join members for workouts (“Bring A Friend Day,” as it’s called). It’s a little bit of a misnomer, as guests don’t necessarily have to be friends — as one coach likes to describe it, “bring your friends, neighbors, coworkers, colleagues, enemies, ‘frenemies,’ whomever.” It doesn’t necessarily have to be by invitation; anyone interested in trying CrossFit can come to these classes — a type of “try before you buy” session, if you will. What’s interesting is those who don’t try it and outright refuse my offer to join me. (As I tell people, joining me in these sessions pretty much guarantees that I will work out on Saturday!) I tried to tell one friend that I thought CrossFit might benefit her. Not only did she outright refuse to take me up on it, I got the impression that she was actually scared to try it. She would not even keep an open mind about it; she just said, “I will NOT do it. Don’t ever ask me about it again.” End of conversation. I would never twist anyone’s arm into trying it (well, okay, maybe friends with whom I know I can get away with it), but what I don’t completely understand is why people fear it. I get why people won’t do things like go bungee-jumping (disclosure: I am deathly acrophobic), eating exotic foods (I’ll try almost anything, although I draw the line at anything that has more than four legs, shellfish excluded — Andrew Zimmern I’m not! ), or do something on a dare. But why are people afraid to try CrossFit? I think part of it is that it’s human nature to fear what you don’t know. People will see these images of CrossFit (I often post what I do on Facebook) and immediately get the impression that they’re expected to be able to lift large amounts of weights, be pushed to do double-unders, or be able to do pull-ups right off the bat. The fear of “gymtimidation” comes into play. People who fear it are likely afraid of being embarrassed or injured. First, one of the selling points of CrossFit is that anyone can do it. I’ve seen people as old as eighty (and even more!) in the gym. I once saw a guy who had the use of only one arm in a workout (it was interesting watching him on a rower and an Assault bike). I’ve seen newbies who struggle with weightlifting form. Even I have my own struggles; I can’t (yet) do any moves that involve pulling myself up (pull-ups, muscle-ups, rope climbs, etc. ), I have trouble with movements that involve squatting (I was diagnosed with osteoarthritis in my knees), and I’m not exactly the fastest runner (for me, there’s almost no difference between a jog, a sprint, or a fast walk). Heck, even some warmups can sometime leave me out of breath. However, one of CrossFit’s selling points is that it is scalable. You are never asked to do anything you are not capable of doing. If you have trouble with pull-ups (like I do), you can do barbell pull-ups or ring rows. Unable to do a certain type of weightlifting movement? Don’t worry about the weight; instead, use a lighter weight, an empty bar, or even a PVC pipe, and practice your technique. Whatever movement gives you trouble, there is always a way to scale it that will allow you to perform it to your capabilities. I’m sure the fear of being injured comes into play. As I just said, you’ll never be pushed to do what you’re not capable of doing. But one of the selling points for me is that CrossFit emphasizes technique. If you are not sure about how to do a movement, coaches will teach you how. If your form has issues, coaches will tweak it so it is better. Technique is key to anything: the better your form, the less chance you’ll be injured. I also think the intensity is a factor. CrossFit can get very intense. Admittedly, there isn’t a lot that’s enjoyable about working your tail off to the point where you’re gasping for breath and end up lying on the floor. That’s something that can scare people off. However, how hard you work out is up to you. Intensity is what you make of it. But why is it so intense? I think it’s because the majority of people who take CrossFit seriously want to improve. People push themselves because they want to get better at what they do. Did a deadlift weight of 305 pounds? Next time, I’m going to try 315. Run 5,000 meters in under ten minutes? Next time, shoot for nine. CrossFit is about making yourself better. While you are not asked to do anything you can’t do, you are asked to challenge yourself and push the limits of what you can do. Even my own gym’s motto is “(Be)tter” (as in, “be better”). I wrote before that you have to get uncomfortable in order to improve. Making yourself better involves going out of your comfort zone. How much discomfort — intensity — you decide to put into it is up to you. Finally, there’s the phenomenon that Planet Fitness refers to as “gymtimidation.” People are embarrassed by their lesser skill level and are often intimidated by performing in front of other people who are in much better shape. This attitude does not exist in CrossFit. Everyone — even the elite athletes — roots for everyone else to succeed. I remember one time watching the CrossFit Games on TV and hearing the commentator say, “CrossFit is probably the only sport in which the person who comes in last gets the loudest cheers.” Even in events where athletes are finished, they will often go back out into the field to cheer on and encourage those who are still working through the event. Here’s a secret: everyone, at some point in their lives, was a beginner at something. Someone once said that one of the worst phrases ever coined was “do it right the first time.” It’s almost never done right the first time. Fear of embarrassment should never be a factor in trying something new. I wrote before that CrossFit is a supportive community. I have made a large number of friends in CrossFit, and even though I look more like a couch potato than an elite athlete, I feel as comfortable with this group as I do as any group in which I’m involved. Although people have their reasons why they don’t want to try CrossFit, fear should not be one of them. CrossFit can be a fun and exciting way to keep fit. Give it a try. Who knows? You might just get hooked — like I did! And if any of my local friends are interested in hitting a Saturday “Bring A Friend” WOD, hit me up! A few of us in the office were discussing plans for the upcoming Memorial Day weekend. I mentioned that I was doing this thing on Monday called Memorial Day Murph (those of you who CrossFit know what I’m talking about). I tried to describe the workout, and I couldn’t remember the movements and rep scheme, so I looked it up. In doing so, I came across this article that talks about “surviving” Memorial Day Murph. First, I want to talk a little about the article. Doing Murph as prescribed (“Rx’ed,” in CrossFit parlance) is not for the faint of heart (literally — it’s a pretty intense cardio workout). I generally make it a point to make sure I’m hydrated (I do this, anyway) and to make sure that I’ve had something to eat before I attack it. I also make sure that I scale. I am not in the class of Mat Fraser, and likely never will be. (When I was a kid, I had a dream of playing for the Yankees, too. You probably can tell where that went. But I digress.) I have yet to run a full mile; I have enough trouble running a fraction of that. I don’t remember how I scaled it last year; I might have done something like an 800m run (admittedly, I usually end up walking a good chunk of it), ring-rows instead of pull-ups (I still can’t do a pull-up to save my life — I’m working on it), and a reduced number of push-ups and squats. Nevertheless, even scaled down, it still makes for a pretty serious workout. But I will say that if a longtime self-admitted couch potato like me can do it, so can you. I also want to talk about the spirit of “Murph.” Murph is what CrossFitters refer to as a “hero WOD” — that is, a WOD (Workout Of the Day) that is named for and to honor a hero — in this case, Navy Lieutenant Michael Murphy, who was killed in Afghanistan in 2005. (Memorial Day Murph was even made into a fundraiser.) Hero WODs tend to be intense — moreso than the typical CrossFit WOD. Every Memorial Day, CrossFitters around the country do Murph in the spirit and honor of this fine man who died for his country. It is a way for CrossFit athletes to honor this hero, but it’s also a reminder as to what Memorial Day is about. And, of course, Memorial Day is known as the unofficial start of summer, and is usually accompanied by barbecue, burgers, hot dogs, and beer. My CrossFit gym is no different; Memorial Day Murph is followed by a cookout, along with plenty of camaraderie. Our gym members are a close-knit group, and I’m sure other CrossFit gyms are similar. So, I’ll be spending my upcoming Memorial Day holiday hanging out with a bunch of CrossFit athletes while trying not to exhaust myself from a regimen of running, pull-ups (likely ring-rows for me), push-ups, and squats. And a good time will be had by all. The other day, a thought popped into my head for no reason (that happens occasionally — doesn’t it happen to you? ): “I feel like hanging out with my CrossFit family.” I don’t know why I started thinking about it, but I was thinking about the great times I’ve had hanging out with my CrossFit friends outside of the gym — bowling night, playing poker to raise money for charity, going out to dinner, and so on. I’ve been a member of my CrossFit gym for over three years (and counting) now, and I’ve made a lot of great friends in the process. Who would’ve thought that I, a longtime self-admitted couch potato, would happily be spending his free time hanging with a bunch of athletes at a gym? Ever since I started doing CrossFit, I’ve heard a lot of people refer to “their CrossFit family.” This term, much less, concept, is nothing new. Among all my activities, I’ve heard references to “my music family,” “band family,” “SQL family,” and so on. As it’s been often said, “family” is more than flesh and blood; it’s about people to whom you’ve gotten close and learned to trust. We as social animals thrive on these relationships. The fact that I’ve managed to stick to a fitness program for more than three years is a huge deal, and I believe that the support system — all these friends I’ve made — is a big part of that. A support system of friends can make almost anything pleasurable. I’ve met a lot of great people in CrossFit, and one of the big things is that these people make me want to go to the gym. When you have great friends and a solid support system around you, anything is possible. But here’s the funny thing: it’s true. I know this because I’ve experienced it. For me, the eye-opener happened years ago when I took a Dale Carnegie course. We did a demonstration where I stood up and held my arm out while the trainer tried to push down on it. But here was the caveat: he did this exercise twice. The first time, he told me to say aloud, “I am weak and worthless.” He told me to say it and believe it. And he also told me to fight him as he pressed down on my arm. I fought him as best I could, but he pressed my arm down fairly easily. The second time, he told me to say — and believe — the words, “I am strong and worthy” (or something like that — it’s been years, so I don’t remember the exact words). He repeated the exercise. This time, I was able to keep my arm straight and stiff. I sure became a believer that day. Examples of this abound everywhere, especially in CrossFit. I wrote in a previous article that, at best, I could only stick with a fitness program for a few months. I’ve been going to CrossFit for almost two and a half years (28 months as of this article, to be exact, and counting). The primary reason why I’ve stuck with it is the support system. CrossFitters want you to succeed. They continually push you to be better. I remember watching the CrossFit games where the announcer said, “CrossFit is probably the only sport where the person who comes in last gets the loudest cheers.” I have made a number of friends through CrossFit, and I absolutely love the community. During my junior year in college, I was struggling with something — I don’t remember what it was — and a classmate sent me his favorite poem, hoping it would pick me up. It did. It has since become one of my favorite poems as well. 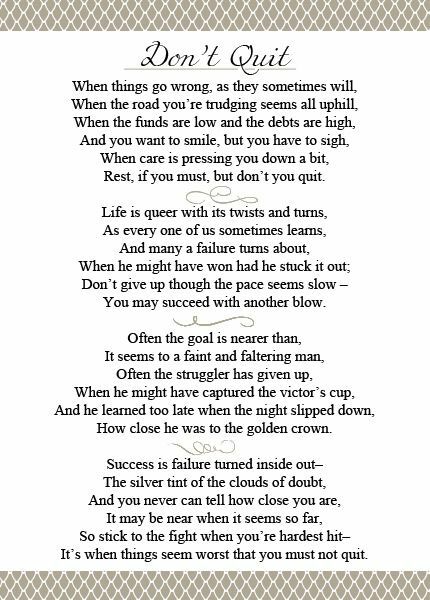 I have a small plaque with this poem hanging on the wall of my home office. I’ll look at it occasionally, whenever I feel the need. Have you ever thought about your own obituary? (I apologize for the morbid thought.) Dying is something we’re all going to do someday. When that day arrives, what kind of a legacy do you want to leave behind? This week, I had the misfortune of attending two different wakes for two different people. Interestingly, I did not know either person well; in one case, I was friends with the deceased’s sister, and in the other, the deceased and I had mutual friends. In both cases, despite not knowing the deceased that well, I felt compelled to go. Mainly, I went to support my friends in their time of grief. However, both people had compelling life stories that made me wish that I had known them better in life. I don’t remember the exact wording of the quote, nor do I remember where I read it, but I remember reading something to the effect of “the way you measure the success of your life is by the number of people who show up for your funeral.” Okay, granted, after I pass on, I won’t know how many people will show up at mine, but I’d like to think that a large number will show up. When it comes down to it, how you live your life and how you treat others will likely be your legacy. So make the best of it. As someone once said, live every day like it’ll be your last — someday, you’re going to be right. This is an addendum to my CrossFit article from Thursday! I got home this evening, turned on the local news, and whose face did I happen to see on TV? None other than Shye Evan, whom I mention in my earlier article! WNYT (the local NBC affiliate) did an article about the CrossFit Games East Regional being in town, and they featured Albany CrossFit, my gym!